Pinched into “cats’ ears” or hand-pulled; made from wheat, rice, buckwheat, or beans; served in soup or fried; fresh, dried or instant – the world of noodles is a varied and delicious one. In 2005 a 4,000-year old bowl of noodles was unearthed by archaeologists in China’s Qinghai Province. (Discovered in surprisingly good shape for a millennia-old meal, the noodles are a testament to the long shelf lives of Chinese foodstuffs, are they not?) By the first century AD, watermills had made it possible to mill grain on a large scale, and noodles had become a popular Han dynasty snack – China’s original fast food. Noodle-making slowly spread throughout East Asia and beyond. Each region adapted noodle-making techniques to suit local ingredients and tastes, resulting in the variety we enjoy today. It was this variety that I fell foul of last week, when I was shopping for my Burmese breakfast and bought mung bean vermicelli instead of the kind made from rice, and ended up with a bowl of tender, transparent worms rather than chewy opaque threads. So! I decided that it was time to educate myself about all things noodley. A line runs across China, roughly parallel to the Yangtze River, dividing the wheat-producing north from the rice-growing south. 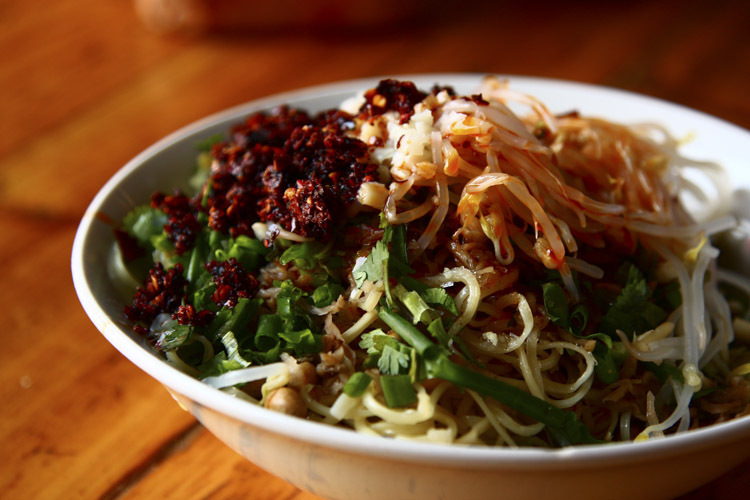 In the north, noodles have traditionally been made from wheat (and known as miàn 面), while rice-based versions (usually with fěn 粉 in their names) have been more popular in the south of the country. Dried wheat noodles are opaque and brittle before cooking. To cook, throw them into boiling water for around 4 minutes – longer for thicker noodles. Drain and rinse when cooked, before serving in soup, with sauce or adding to the end of a stir-fry. Beware that wheat noodles get particularly sticky as they dry, so you’ll need to mix through a little oil if you’re not planning to use them immediately. Try them in my recipe for cold sesame noodles. Other flavourings are sometimes added to plain wheat noodles – here in Hong Kong, egg is one of the most common additions (duck egg for maximum flavour, chicken egg if you’re being cheap). The noodles are a rich yellow colour and have a deeper flavour than the plain flour-and-water version above. Cook the thinner noodles in boiling water for 3-4 minutes before draining, 4-5 minutes for the thicker ones. Known as bee hoon in Malaysian and Singaporean kitchens and occasionally called “rice sticks” in English, thin rice vermicelli are the mainstay of street food stalls from Shanghai to Surabaya. These translucent threads are first softened in cold water (soak for 8-10 minutes) before adding to soup or frying. Try them in my recipe for Burmese noodle salad, where they’re boiled very briefly (a minute or so is enough) after soaking. A Cantonese favourite, ho fun are thick ribbons made of rice flour and water, their name meaning “river noodles”. Brittle and translucent when dried, they become robust and chewy once you’ve cooked them. Ho fun are used in a variety of noodle soups here in Hong Kong, and – perhaps most famously – fried with beef and onions for a popular meal, dry-fried beef noodles (gàn chǎo niú hé 干炒牛河). Mung bean noodles are curious things. They come out of the packet opaque and tough as anything (one reason why they’re often sold in individual portions is because they’re such a pain to divide when dry), then slowly swell into soft, transparent curls as you cook them. They’re often added to soup or fried, and rumour has it that they can even form the base of a decent salad… Soak in cold water for 7 minutes before adding to soup or frying, or boil for a further 3-4 minutes if you’re using them for salad. Where would a discussion of noodles be without mention of instant or 3-minute noodles? Billions of packs are consumed each year, for better or for worse… Here in Asia, wheat noodles are cooked, shaped into those lovely wavy pattens and then flash-fried (usually in palm oil) to reduce the moisture content and increase their shelf life. (Outside Asia the flash-fry is usually exchanged for air-drying.) A quick soak in hot water and voilà! A delicious bowl of noodles will be yours! I have to admit that vermicelli is my favourite, but now will try other kinds too. Very nice post.